This post has several purposes, as you can see from it's title. First of all, I just wanted to let those who are waiting for more Innocent's Verse know that more is coming, very soon. As long as LJ cooperates that is. The third chapter is written and I'll try posting it as soon as I have a couple hours to wrestle with LJ. I also wanted to give anyone who might be interested a little insight as to why it's taken so long in between posts. You see, I got a new job and it's a wonderful job, I love it, but it's very demanding. I don't have as much free time as I used to have and when I get home from work, I'm pretty wiped out. My husband also got a new job which he loves. Mostly he loves it because he now has weekends off. So the weekends, when I used to have time and a quiet house for writing, are now taken up with doing things with my husband. It's great for our marriage, not so great for my stories. But the comments, the pokes, the prods, from wonderful readers, really do help keep me motivated. I'd like to say that it doesn't matter to me whether anyone likes my stores, but I can't say that. It does matter, a lot. The only way I know that anyone enjoys my stories is if I get comments on them. I know it's not fashionable or popular to admit that. Oh well, the truth is the truth after all. My career used to involve writing business articles and papers. I started writing fanfiction because I was in a career slump, didn't feel very appreciated at work, and was craving some positive reinforcement. At the same time, I started reading fanfiction and, while I LOVED many of the stories, they often left me wanting more comfort for Dean. There was usually plenty of hurt, but not much comfort. Even stories that proclaimed themselves to be hurt/comfort rarely had enough comfort for me. Dean is stoic and doesn't accept comfort easily, or at all. I completely understand that this quality of his makes most of us Dean girls love him all the more, but I wanted stories where Dean allowed himself some comfort. I got to the point where I would modify other writer's stories in my head to give Dean the comfort I craved. Eventually, I decided to write my own stories and post them, just to see what would happen. My business writing gave me a good start on the basics of writing. Storytelling is very different from business writing though, so I had no idea whether I'd be able to do it and most of the time I still doubt my abilities. Which is why the comments are so important. I do have some sad news. 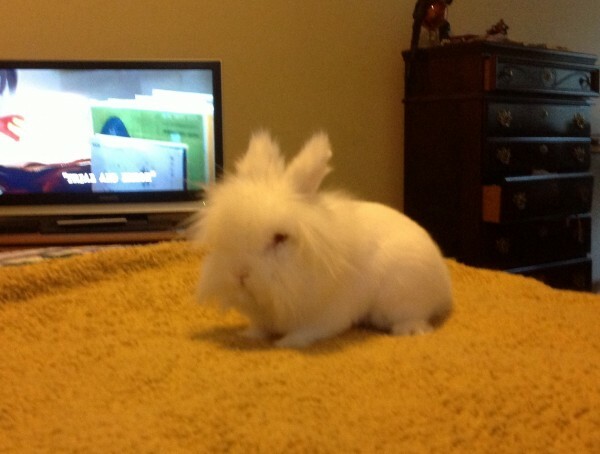 Many of you know that Mr. Bun, Jensen's much-loved stuffed rabbit, is based on my real pet rabbit. Well, my Mr. Bun died in the Fall. He was such a sweet bunny, loved being held and cuddled. I miss him very much. When I write about Jensen's Mr. Bun, it brings a smile to my face because it always reminds me of my sweet bunny boy. I'll see you over the rainbow bridge, Mr. Bun. Lastly, I wanted to ask for some LJ help from anyone who knows how LJ works. My LJ page has reverted back to a basic page and the banner has been lost. I'm not sure how this happened. Does the fact that I let my paid subscription expire have anything to do with it? I would gladly pay the subscription fee if I thought that would fix the problem, but I don't want to pay for LJ if my page is going to stay the way it is now. Also, when I look at other people's LJ pages, they all look like they have reverted back to basic pages without banners. I'm assuming that's just me though or other people would be raising a fuss and I haven't seen any posts about it. Thanks for all the support I've recieved from you all in the past! I'm so glad you have been writing. I love your verse. It is the right mix of hurt/comfort. Good luck uploading. I don't know as much about the LJ pages as others so I'll let them help you out but I know you can make changes in your settings/profile. Good luck. Hugs and thanks for the update! Hi lady! Oh it's so good to hear from you, and more importantly, to hear that it's mostly *good* things that have been keeping you busy! So happy for you on the job front; I'm currently stuck in a career rut, myself, so I can completely understand the relief and excitement from a new job that you actually love! I'm so sorry to hear of the passing of your beloved pet; my heart breaks for you, but I'm glad he lives on in the fic! Now, to the fic-gushing... I am so enamored with and fascinated by your Innocents 'Verse, that to hear there's an update coming is bringing me physical jitters of joy! Your stories have such depth and emotion - it's something that is so lacking from most of the SPN fiction community. Also, your 'Verse is the first that turned me on to SPN-age-play-like works, and there are almost none in the volume that's sprung up that can compare to the quality of yours (if you're an AO3-er, TsukiChibi/SailorChibi's works are about the only ones that are around the same level as yours). I could go on, but please just know that I'm a huge fan of your work and I'm glad that real-life is treating you mostly swell! RE: Hugs and thanks for the update! I hope your rut comes to a satisfying conclusion. For me, I feel as though I've found the place where I'm meant to be. It's a good feeling. Thank you for the wonderful praise. I eat that stuff up!!! I'll be checking out the rec you gave me as well. I'm always on the look out for high quality fic to read. See you posting is so lovely!!!! Have you contact the lj staff? Because I know some people have randomly lost stuff, like sticky posts (as it happened to me) some of them have succeded in retrieving them but I have no idea why. Did you get the super-long e-mail I sent you today? I have not contacted the LJ staff because they have never been much help to me in the past. Glad to hear that your RL is going so well, though sorry to hear about Mr. Bun. He does look very sweet. I'm not too sure about LJ, but as the paid subscription gives extras for setting up the page and it reverted when the subscription expired, that may just be the reason, but it could also very well be shennanigans by LJ. Maybe contact TPTB at LJ? Shenanigans indeed. I've had a lot of trouble with LJ and help is rarely forthcoming. I haven't contacted anyone at LJ about this issue because the only other time I tried, the response I got came days later and didn't actually offer anything in the least bit helpful. And I had a paid account at the time. I would have thought the LJ staff would want to keep their paying customers happy. Firstly, I'm so sorry to hear about your Mr Bun, heading off over the bridge. He looked like a very happy, contented bunny, and having kept houserabbits myself, I know how affectionate and entertaining they can be. His legacy will live on as Jensen's much-loved Mr Bun. I'm also delighted to hear that a new chapter of Innocents!verse is imminent. I truly love this verse, because you've captured the need for Dean or Jensen comfort that I love to see in stories too. I'm a hurt comfort girl, but for me, the comfort is far more engaging than the hurt. I'm afraid I'm not a technie, but I would guess that your paid account lapsing would very likely have something to do with you losing your banner and other features. I really wish I could offer something a bit more useful, but as I said, I'm no techie! I'm glad to hear you've finally found the job you deserve, that fulfils you and a company that is intelligent enough to see what you're worth to them! I guess I'll try renewing my paid account. Maybe that will fix it. Since it's the first of Feb. I'm guess that you didn't get the LJ thing resolved. Hope for a new chapter soon. :) And just wanted to note that you don't have your last story included in your Master List. Might want to add it when you add the next chapter.